British natural gas imports from mainland Europe in Q1 2018 surged after cold weather – culminating in the “Beast from the East” – sent prices sky high. Two key pipelines are fighting for shipper’s business in Q1 2019. 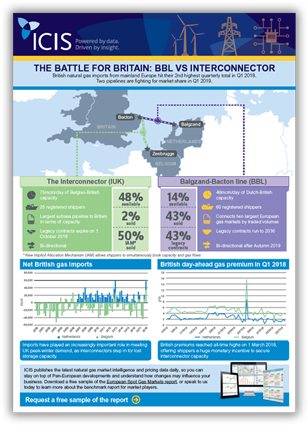 This infographic by ICIS senior markets reporter Thomas Rodgers highlights the differences between the BBL and the Interconnector and shows what capacity has been sold and what is available. Stay ahead with the changes in the wholesale natural gas market with the European Spot Gas Markets report, the benchmark for European natural gas.